I made these this morning instead of oatmeal for the boys, they were “scrumptious” as my 5 year old described them. I often try to avoid grains but once in a while, if we’re going to have some, this is a great recipe. 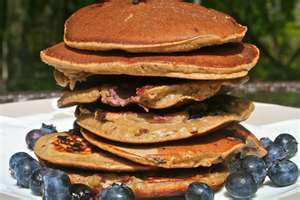 I’m making them again tomorrow morning, so easy and a big hit. I got the recipe from this book and tweaked it a little. 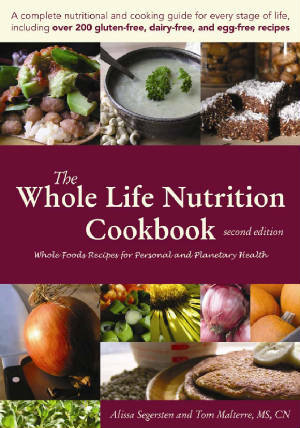 There are some great recipes in this book and if you live in Halifax, you can purchase it from Hydrostone Osteopathy. Otherwise it’s a little more pricey to order online with shipping costs it totals around $36 from www.WholeLifeNutrition.net. Grind oats in food processor, coffee grinder or Magic Bullet. Place ground oats, baking powder, and baking soda in a medium sized bowl and stir together. Combine wet ingredients (milk, coconut oil, maple syrup, and mashed banana and stir together. Pour the wet ingredients into the dry ingredients and mix together. Be careful not to over mix batter. Gently fold in the blueberries. Add more rice milk if batter seems too thick, mine was just right. Heat skillet over medium-low heat. Add a little coconut oil and drop the batter by the 1/2 cup full into the pan. Cook for a couple of minutes on each side. Watch temperature closely to avoid burning. Add more coconut oil to make next batch. Repeat this process until all the batter is gone.